Renewable energy commercialization involves the deployment of three generations of renewable energy technologies dating back more than 100 years. First-generation technologies, which are already mature and economically competitive, include biomass, hydroelectricity, geothermal power and heat. Second-generation technologies are market-ready and are being deployed at the present time; they include solar heating, photovoltaics, wind power, solar thermal power stations, and modern forms of bioenergy. Third-generation technologies require continued R&D efforts in order to make large contributions on a global scale and include advanced biomass gasification, biorefinery technologies, hot-dry-rock geothermal power, and ocean energy. There are some non-technical barriers to the widespread use of renewables, and it is often public policy and political leadership that drive the widespread acceptance of renewable energy technologies. Over 100 countries now have targets for their own renewable energy futures, and have enacted wide-ranging public policies to promote renewables. Climate change concerns are driving increasing growth in the renewable energy industries. Leading renewable energy companies include First Solar, Gamesa, GE Energy, Q-Cells, Sharp Solar, Siemens, SunOpta, Suntech, and Vestas. ...that the word smog is a portmanteau of smoke and fog? ... that the idea of atmospheric gases trapping the Suns heat to produce the greenhouse effect was put forward by Joseph Fourier in the 1820’s? ... that since 1500 CE 784 extinctions have been documented by the International Union for Conservation of Nature and Natural Resources? June Haimoff is an English environmentalist who settled in Dalyan in southwestern Turkey (Muğla Province) after her retirement and has launched a successful campaign for the conservation of loggerhead sea turtles (Caretta caretta) which lay their eggs in the İztuzu Beach in Dalyan. She relates the struggle and the victory for the preservation of these species in her book titled Kaptan June and the Turtles published in 1997. 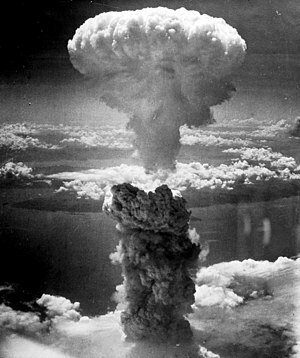 The detonation of nuclear weapons leads to the release of radioactive material into the environment. This radioactive material affects human health and the natural environment.